People with intellectual disability have the same right to vote as all other Australians. Disability law and service delivery regulations compel disability support organisations to support voters with disability, while the United Nations Convention on the Rights of Persons with Disabilities points to a society that fully supports the development of accessible political education, election materials, election campaigns, and voting centres. Inclusion Melbourne commenced its journey with electoral inclusion research in 2013, leading to a partnership with Melbourne Law School in 2015, a Victorian Government funded study tour of global sites of best practice in 2016, a VEC-funded research partnership with La Trobe University in 2017, and now an electoral inclusion campaign in preparation for the 2018 State Election. 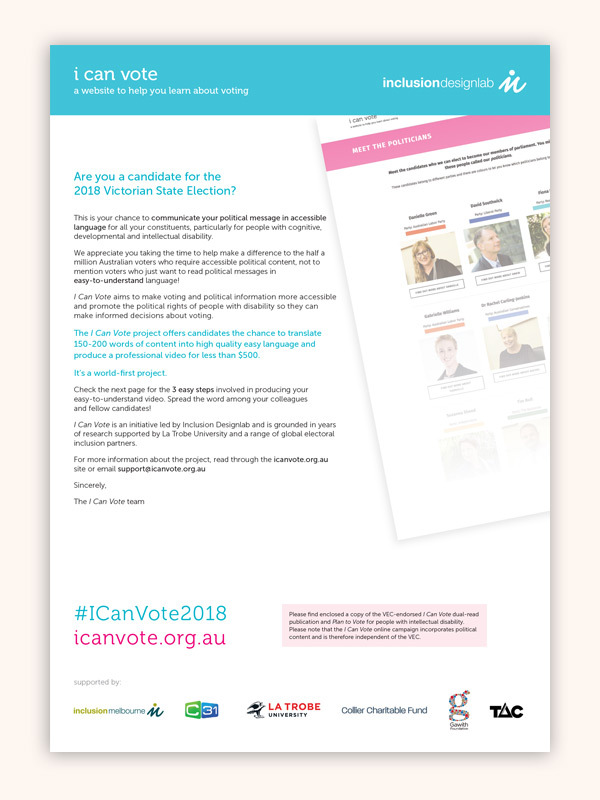 Are you an election candidate in the 2018 Victorian State Election? Get involved here. A letter to candidates for the 2018 Victorian State Election about how they can be involved in this world-leading project. Help make a difference to voters who have an intellectual disability, autism spectrum disorder, acquired brain injury, or communication impairment, not to mention voters who just want to read political messages in easy-to-undersand language! 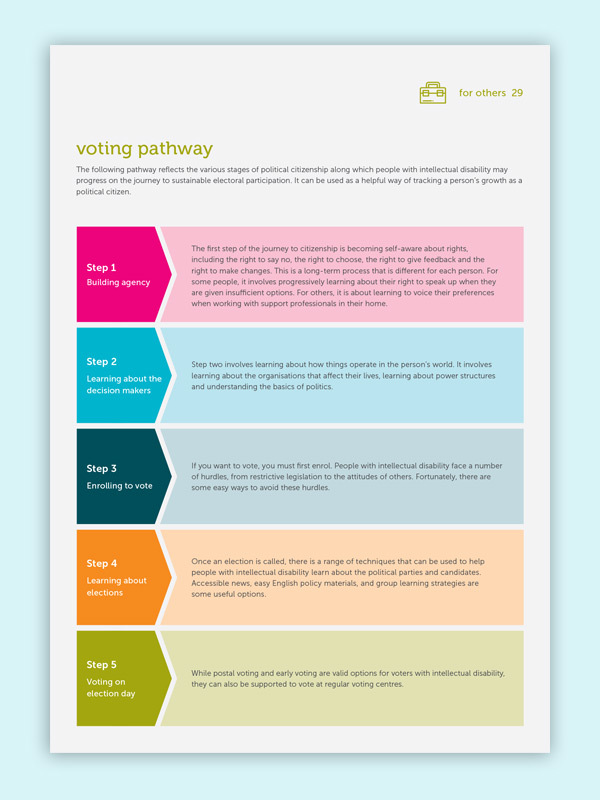 Pathways to Voting describes the different stages involved in political citizenship, successfully engaging with the voting process. This website supports the different stages within the sections of the site. The Meet the Politicians videos support the voter to learn about the political parties and candidates. A guide for people with a disability, their family carers, friends, advocates and support professionals. 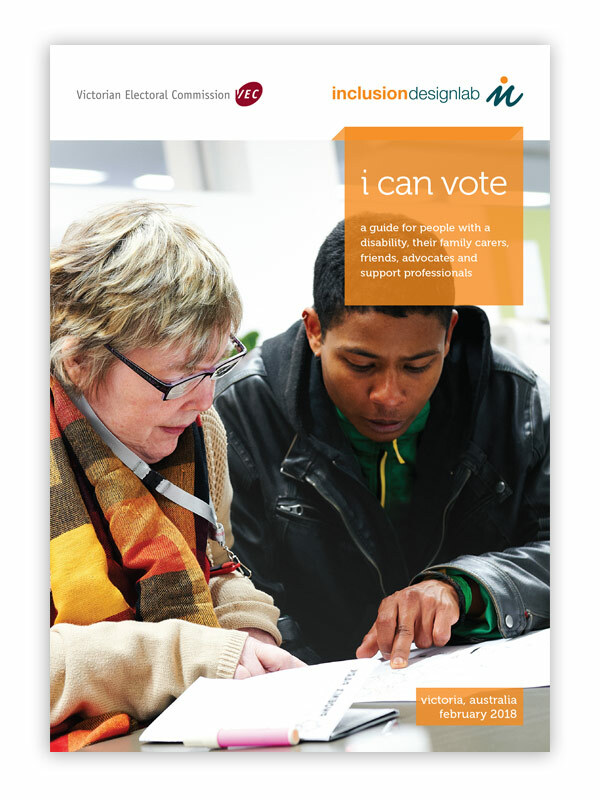 This is a dual read guide to support voting by those with an intellectual disability. It works best if the voter with a disability and supporter read it together. It includes more detailed information for the supporter to assist the voter with a disability to engage fully in the voting process. 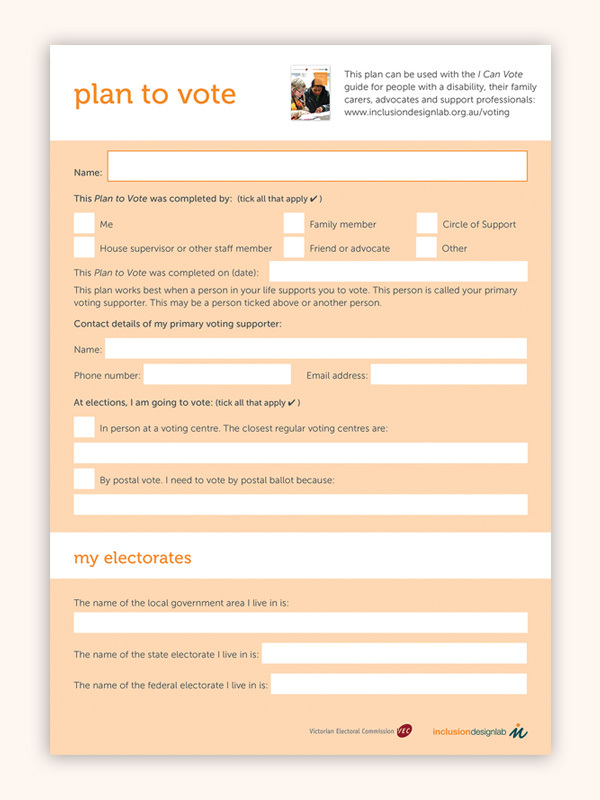 A form for the voter to plan how they will get ready to vote, with help from a supporter. 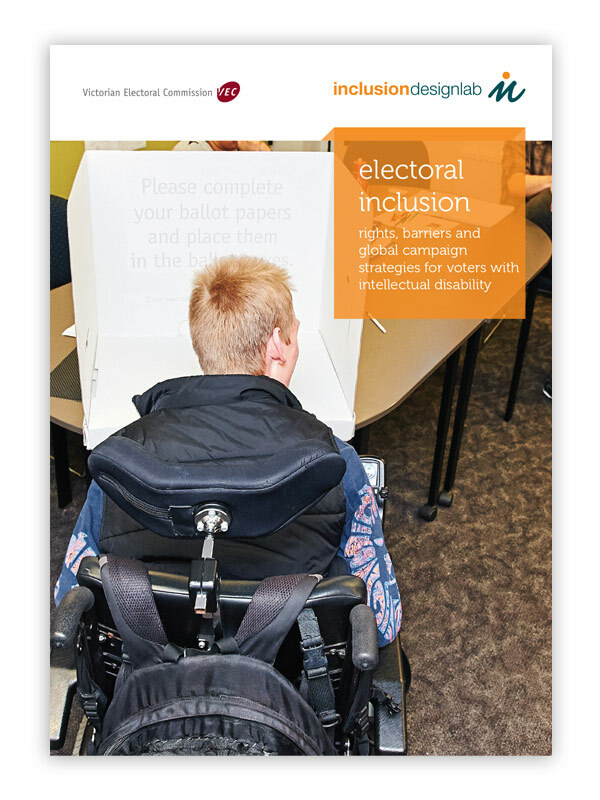 Electoral Inclusion is a discussion paper on the rights, barriers and global campaign strategies for voters with intellectual disability. Voters Voice is a app designed to help people with complex communication difficulties to vote in person at Victorian elections. The app also assists people with low literacy and English language difficulties. The VEC's Education and Inclusion Team explores the role democracy plays in people's lives and encourages a culture of active citizenship.Our aim is to facilitate electoral inclusion by empowering people with the knowledge and skills to participate. 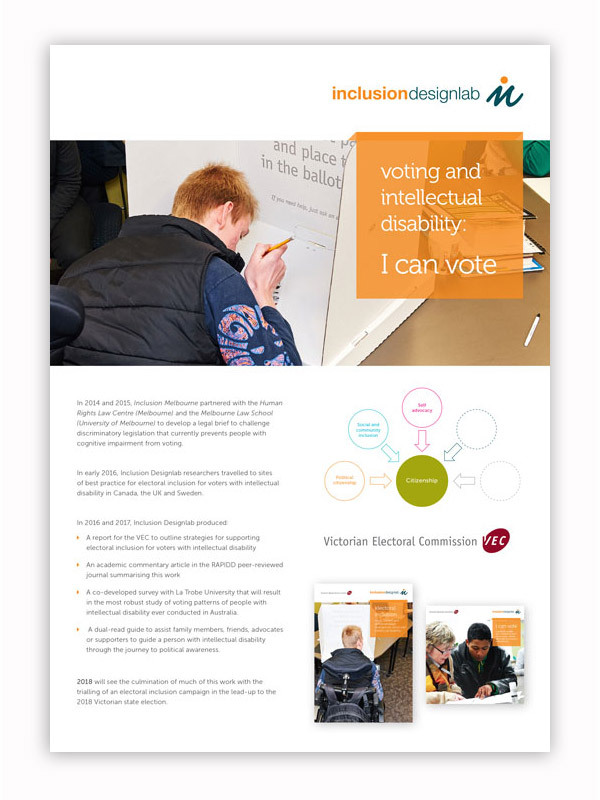 This page details many resources available to people with disabilities including Electoral Outreach where they can come to you and run sessions to support electoral education and practical support with the voting process.